This fun and festive adventure is sure to inspire holiday happiness and lasting memories! Offered each year on the first, second and third Saturdays in December from 10 am till noon. 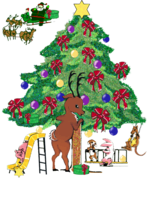 This is a wonderful opportunity for your little one(s) to visit with Santa and his animal friends at Jubilee Zoo. Pre-registration required! $10 per adult includes breakfast, most children's activities and the joy of making lasting memories with your little ones!